When we last checked in with Prep Baseball in Mid May, Maryland was through its regionals, the private schools were mostly done, DC was still finishing the regular season, and Virginia was just starting up its District (aka “Conference”) tournaments. Lets see where we stand now after the Memorial Day weekend and a slew of tournament results. Text in Red are pending results, mostly from the southern Virginia districts and regionals, which don’t have to start as soon as Northern Virginia tourneys. 6-A Conference 5/Concorde: Chantilly regular season champ. Seeds held to form in the district tourney and Chantilly met Oakton in the district final. Chantilly beat Oakton 2-1 to take the district title. 6-A Conference 6/Liberty: McLean regular season champ. #5 seed Fairfax upset McLean to make the District final, where they met Madison. In the district final, Madison avenged an earlier loss to Fairfax to win 2-0 at home to take the title. 6-A Conference 7/Potomac: Lake Braddock regular season champ. #2 and #3 seeds Annandale and West Potomac were both upset and knocked out of Regional competition. Lake Braddock met #6 seed South County in the district final and beat them easily 12-4 to win the title. 6-A Conference 8/Cedar Run: Patriot regular season champ. Battlefield had to forfeit its semi-final win over pitcher innings/pitch count limits, so Osbourn Park made the district final, where it subsequently beat Patriot in extras to win an unlikely district title. Battlefield’s forfeit was absurd; their starter Jake Agnos struck out 21 *straight batters* in the 6-1 victory … and then resulted in a forfeit loss. Agnos gave up a lead-off homer … and then retired the next 21 guys he faced. I’ve never heard of such a feat. 6-A North Regional Qualifiers (in seed order). Here’s the 6-A North bracket. Play begins 5/29/15. Quick predictions for 6-A North regional tourney: I like Madison, Oakton, Patriot and Battlefield, since they were basically the best 6-A teams all year. But do not count out Chantilly or McLean. Thanks to their district forfeit, Battlefield drops to a #3 regional seed and a headache for a higher seeded team. And McLean’s upset loss dumps them to a #3 seed as well in the region, despite besting perhaps the best 6-A baseball district in the regular season. With the draws out, Battlefield faces Oakton in the first round, which is tough. If seeds hold it’ll be Lake Braddock-Madison and Patriot-Chantilly in the regional semis. 6-A South Region: which is mostly big-time schools in Richmond, Roanoke and Virginia Beach area. But there are just enough schools in Woodbridge proper to form a 6-A conference closer to DC with teams that are typically considered for All-Met rankings. Because 6-A’s regional is only 8 teams, their district tournaments are not yet complete as of the time of this posting. 6-A Conference 1/Coastal: First Colonial (aka Mark Reynolds‘ alma mater) regular season champs. They were upset in the districts but still qualify for the regionals. In the district final, Cox claimed the second regional birth with a win over Ocean Lakes. 6-A Conference 2/Monitor Merrimac: Western Branch regular season champ. However #2 Grassfield got them in the district tourney final. 6-A Conference 3: Franklin County (Rocky Mount, south of Roanoke) regular season champ. In the district tourney #5 seed Cosby scored three straight upsets to claim the district title, beating Thomas Dale in the final. Cosby made the State semis last year and is looking to get back after an up-and-down regular season. 6-A Conference 4: Forest Park (Woodbridge) regular season champ. Forest Park also won the district tournament, beating Colonial Forge 10-2 in the final. Colonial Forge had upset #2 seed and perennial powerhouse Hylton in the district tourney semis to claim the 2nd regional berth. Quick predictions for 6-A South regional tourney: Western Branch is the only team in the state getting national attention, and they’re ranked #1 in the Hampton paper’s local rankings. So I look for them to claw their way to the state tournament. 5-A Conference 13/Capitol: Marshall regular season champ. Seeds held to form (with Marshall beating Lee by the astounding score of 21-0 in the district semis), and Marshall met Edison in the final. In that final Marshall beat Edison 4-1 for its 10th straight win. 5-A Conference 14: Stone Bridge (Ashburn) regular season champ. In the playoffs, 1/2 met in the final and Stone Bridge beat Broad Run for the district title. In the 3rd place game, Briar Woods grabbed the 3rd regional bid. 5-A Conference 15: Mountain View (Stafford) regular season champ. In the playoffs Mountain View and Potomac (Dumfries) met in the finals, where Mountain View pulverized them 10-0. In the 3rd place game, North Stafford easily grabbed the 3rd regional bid. 5-A Conference 16: Halifax County regular season champ. They met #2 seed Patrick Henry in the final and Patrick Henry upset Halifax for the district title. 5-A North Regional Qualifiers (in seed order): 5-A North regional bracket here. Play begins on 5/29/15. Quick predictions for 5-A North regional tourney: I like Stone Bridge to repeat, Marshall could be a challenger. They are on opposite sides of the draw and could both make the regional final. But non-DC area teams like Patrick Henry and Mountain View could be challengers. 5-A Conference 9/Atlantic: Kellam (in Virginia Beach, aka Ryan Zimmerman‘s alma mater) regular season champ. Kellam was upset in the district tournament, with Princess Anne claiming the 2nd regional berth by winning the tourney. 5-A Conference 10/PenSouth: Hickory (Chesapeake) regular season champ (also defending 5-A state champ). Hickory advanced to the district final along with Menchville, who upset 2nd seeded Great Bridge along the way, before Hickory claimed the district tourney as well. 5-A Conference 11: Deep Run (Glen Allen/Northern Richmond suburb) regular season champ (Freeman, last year’s 5-A state finalist, was 2nd in the district). The two teams met in the final with Deep Run getting the double. 5-A Conference 12: Manchester (Midlothian/Southern Richmond suburb) regular season champ. Clover Hill took the district title and the #1 seed in the regionals. Quick thoughts: hard not to believe in the pedigree of Hickory and Freeman; I fully expect them to meet in the regional final. Smaller Virginia Classifications with Northern Virginia ties. 4-A conference 21: Woodgrove regular season champ. Woodgrove also won the tourney, beating Sherando in the district final (both teams move to the 4-A North Regional). 4-A Conference 22: Fauquier regular season champ and tourney champ, beating Eastern View in the final. 3-A Conference 27: Kettle Run regular season champ, Culpepper #2. They met in the tourney final as well, with Kettle Run taking both regular and post-season district titles. 3-A Conference 28: Loudoun Valley (regularly in the AllMet top 10 rankings) regular season champ. They also took the post-season tourney, beating #2 seed John Champe in the final. 2-A Conference 35: Strasburg continues its local dominance, winning the district again. Falls Church’s George Mason (easily the smallest public high school in the Northern Virginia suburbs) was the #3 district seed but advanced to the district finals to face Strasburg. Strasburg took the tourney final, but George Mason advances to the regional tournament. Here’s the state finals results in Maryland, played the week of 5/18/15 Brackets here at the MPSAA website. 4-A States: State Semis were Perry Hall v Severna Park, Gaithersburg-Wise. Severna Park and Gaithersburg each dominated their state semi to force a high-powered showdown of good teams in the 4-A final. In that final, Gaithersburg beat Severna Park 5-3 at Ripken Stadium in Aberdeen for its first ever state baseball title. 3-A States: State semi finalists were North Harford (Plyville in North Maryland), Mt. Hebron in Ellicott City, Chopticon (way down in St. Mary’s county) and Urbana (just south of Frederick). In the state-semis, Mt. Hebron and Chopticon won close games to make the final. In the final, Chopticon’s ace Ljay Newsome threw a complete game 1-hitter with 17 strikeouts to win the title 1-0. 2-A States: State semi finalists: Eastern Tech, Patterson Mill, South Carroll and last year’s champ Southern. Eastern Tech and Southern each won 1-run games to make the 2-A final. In the final, Southern beat Eastern Tech 6-1 to repeat as 2-A champs. 1-A States: State semi finalists: McDonough, Colonel Richardson, Douglass and Brunswick make up this year’s 1-A state semis (mostly smaller schools outside the DC area). In the state semis, McDonough will face off against the tough-looking Brunswick team. Brunswick won the title 4-0. DCSAA: the 2015 tournament is underway, with the final scheduled for Nats park on 5/31/15. Gonzaga is the #1 seed and Wilson the #2. Curiously missing is St. Johns, who won the WCAC and is DC-based. St. Albans upset Wilson in the semis to face Gonzaga in the final. Most private schools’ seasons are now complete. Speaking of Liberty Christian … apparently the school had an open lawsuit against the Virginia High School League (VHSL) regarding membership, and the VHSL settled on 5/20/15. The implication? Quoting the link, “all non-boarding private schools in Virginia will be permitted to apply for membership in the VHSL.” Liberty Christian Academy will now join the 4-A conference 23 (which covers the Lynchburg and Charlottesville area) and can compete for state titles in all sports. I wonder if this ruling will lead to the various private schools in the Northern Virginia Area (including typical sports powerhouses such as Paul VI, O’Connell, Flint Hill, Bishop Ireton, etc) leaving the WCAC and joining the public schools. I doubt it frankly; even the largest of these schools would be dwarfed by the 5-A and 6-A enrollment public high schools, and the WCAC is a fantastic league. InsideNova had a piece on the topic quoting several area ADs of private schools (including Paul VI’s Billy Emerson, a class-mate and longtime teammate of mine), who think perhaps this ruling makes it easier for teams to schedule public opponents … but doubts any league changes will occur with DC-area teams thanks to the strength of the private school leagues here. Washington Post All Met Sports latest Baseball top 10: ?? date: Spalding, Gaithersburg 1-2, then Oakton, Madison, and Battlefield. Stone Bridge 8th despite a win over Madison in Vienna. Baseball America’s High School top 25 (most recent ranking 5/5/15): no DC/MD/VA teams listed. Soon after the conference tourneys finished up, the field of 64 was announced. Earlier this week we reviewed the college season for all DC local teams; now lets talk about the field of 64. This post at d1baseball.com has a great amount of information. Here’s your top 16 seeds (each a regional host). Missouri State (45-10): MVC regular season and tourney champs. I don’t think UCLA is better than the handful of teams ranked below it. They played just 8 games against top 25 teams all year and went 4-4 in them. Teams from the SEC and the Big12 played twice as many quality games and had far better records. For my money, I would have picked one of the SEC teams, likely LSU, as my #1. And I would have had the other (Florida) as #2. Louisville seems about where they should be … and were given a very, very easy regional. I don’t know what to think of Miami or Dallas Baptist (the top two teams by RPI most of the year). Miami’s ACC division was weak but Miami played a very tough schedule. Are they under seeded or over seeded? Either way, Miami was given a very easy regional and these two RPI wonders (if seeds hold) are set to meet in the super-regional. Illinois will be quickly exposed despite their lofty record (Strength of schedule: 175!). They have a sneaky #2 seed in Notre Dame in their regional for an interesting geographical matchup. Missouri State is a good story, but unlike their basketball breatheren I think MVC’s participants will also get exposed. Seeds 9-16: still regional hosts but will travel if the higher seed wins. TAMU is a heck of a good team; i’d favor them over Missouri State in a super regional. Florida State played the 6th hardest schedule and had a 10-6 record against top 25 teams; and they’re just#13 overall? And, to add insult to injury they have to travel to arch rival Florida in a super-regional to advance? Wow. Someone at Florida State must have pissed off a committee member. That being said, pundits seem to think Florida State is chronically over-rated (as are teams like Rice and Cal State Fullerton), so perhaps 13 seed is good. Houston’s regional is a fun one: three teams within Houston city limits. Is UC Santa Barbara more than just Dillon Tate? We’ll find out. Lots of griping about the selection of UC Santa Barbara as a “host.” Instead of playing on-campus, they’re hosting 3 hours away at the Lake Elsinore stadium (host of the Padres’ high-A affiliate). Lots of people asking why not name College of Charleston as the host and then have UVA and Maryland be its 2/3 seeds, instead of forcing the two east coast teams to fly across the country? Maryland, a #3 seed, travels to Los Angeles to be in the #1 seed’s division. Tough draw for them. But probably appropriate seeding. Pundits think Maryland was one of the last teams in. UVA, also gets a #3 seed and has to travel to Santa Barbara. UVA is not a #3 seed; they had worked their way back to the fringes of the top 25 by season’s end, and in RPI they finished #21. That’s the upper end of the #2 seeds, not a #3 seed who is forced to travel 3,000 miles. Now that being said, they get a very winnable regional. UC Santa Barbara may only have one arm and USC is about even with UVA. College of Charleston (and Ashburn’s Taylor Clarke) get a #2 seed (well deserved; they were almost a host) but have to go to Florida State (tough). See commentary above. VCU heads to Dallas for Dallas Baptist’s regional, which also has traditional powerhouse Texas thrown in as a #3 seed. Ouch. Radford gets a #2 seed (??) but heads to Vanderbilt’s regional, who I have as a dark horse to make the CWS. UNC got screwed; probably the last team out. Ask yourself; do you think UNC loses to Maryland in a three-game neutral site series? Yeah, I don’t think so either. RPI of 28 and left out; that’s apparently the 2nd highest RPI of a team left out in a decade. 7th hardest schedule. But if you look at the ACC standings … every team that finished with a .500 or better conference record made the field, and every other team did not. UNC’s conference record? 13-16. If they don’t get swept in their last two conference seasons, they’re in the field. Of the top 8 hosts, I don’t see many upsets. I could see Notre Dame taking out #6 Illinois. I could see NC State giving #7 TCU issues. I’d also say that Missouri State is in trouble .. but their 2/3 seeds don’t seem to scare anyone (Iowa and Oregon). Of the 9-16 seeds, I can see Cal State Fullerton getting into trouble, and I could see a scenario where practically anyone could come out of the Santa Barbara regional. I’m not sure I think Dallas Baptist is good enough to beat two power-houses in Oregon State and Texas. Our first 2015 College Baseball post. All the Division 1 conference tournaments wrapped up over the memorial day weekend, so lets wrap up how our local teams did. We’re writing this post ahead of the regional seedings and the CWS field of 64 announcement. We depend on d1baseball.com primarily for coverage of Division 1 Baseball. Other useful sites include Warren Nolan’s college baseball RPIs and BaseballAmerica’s college coverage. ACC (local interests: UVA, Virginia Tech). UVA had a tough season; it started the season ranked in the top 3 by most charts after finishing as national runner-up last year. Then they lost their best hitter (Joe McCarthy) for half the season, and then lost their ace (Nathan Kirby) for the second half. They swept UVA in their final series of the season to salvage a .500 league record, good enough for 2nd place in their division but not enough to avoid the play-in game. They won the play-in to make the ACC tournament, but went 0-3 in pool play. They are on the outskirts of the top 25 and will make the CWS field, but will not host a regional. Lots of well-known names to this blog and the Virginia area contributed for UVA this season: here’s a link to their season stats. UVA finishes with a 34-22 (15-15) record. Virginia Tech finished just a couple of games behind UVA in the standings, but were no where near the quality. They were eliminated by UNC in the play-in game. Final record: 27-27 (13-16). Of note in the ACC this year to local fans: Stone Bridge alum J.B. Bukauskas was 5-3 with a 4.09 ERA for UNC this year. He was a weekend starter as a freshman, led the team in starts, got their only win in the ACC tournament, and was named to the All-ACC freshman team. Duke Ace, Georgetown Prep alum and Great Falls resident Mike Matuella went from being talked as a 1-1 pick to undergoing Tommy John surgery. Draft pundits still give him a shot of going in the back end of the first round in the draft. Nats 2014 2nd round pick Andrew Suarez went back to Miami and served as Miami’s saturday starter, going 6-1 with a 3.09 ERA for the nation’s top ranked team by RPI. Suarez likely hasn’t improved his draft stock that much, still projected as a 2nd rounder. The A-10 tournament, unbeknownst to me until I looked it up for this post, was at Barcroft field in Arlington. Grr. GW’s home field. I certainly would have made an effort to go had I known. Anyway; GWU hung on as the #6 seed until the semis. Richmond was the #3 seed and was eliminated early by GW. VCU as the #5 seed eventually won the A-10, battering their way through conference rivals. GMU finished just outside the qualification rankings to make the post-season conference tournament. Longwood was the #8 seed, losing early in the post-season tournament. Liberty was the #4 seed and was eliminated by Longwood. However Radford entered the tourney as the #1 seed and outlasted several very good baseball programs to win the tournament and clinch their first ever CWS appearance. Does it sound weird to talk about how Maryland makes the Big-10 conference tournament a “local” tournament? Maryland made the final as the #3 seed before falling to the upset-minded Michigan team. Georgetown went 2 and out as the #4 seed in the Big East tourney. Towson and JMU both had down years and didn’t qualify for the post-season tournament. W&M did, but were 2- and out as the #6 seed. The CAA came down to 1-2, with 2nd seeded UNC-Wilmington beating #1 seed College of Charleston. Of note, College of Charleston was ranked most of the year and was led on the hill by friday ace starter Taylor Clarke. Clarke was 13-1 with a 1.34ERA on the season. Clarke hails from Ashburn and went to Broad Run and then Towson before transferring to CofC and becoming a star. ODU was the #7 seed in the C-USA tourney and went 2-and out. Both teams made the post-season but did not factor in the final. Navy entered the post-season tourney as the #1 seed but lost in the final to #2 seed Lehigh. The big news for Navy this year is the matriculation of a Navy grad to the majors for the first time in nearly a century. 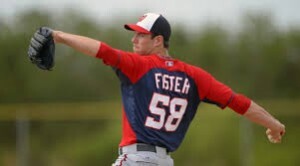 RHP Mitch Harris also has some very personal ties: he played for the Fairfax Nationals in the (now defunct) Clark Griffith summer wood-bat league and was housed by none other than my father for the summer. VMI fought hard as the #4 seed, losing in the tourney semis. Other local players of interest: Madison alum Andy McGuire and his Texas team had to win the Big-12 tournament to get into the CWS, and they did. McGuire went to Texas as a SS/3B but now is in the bullpen for the Longhorns. The College World Series field of 64 will be announced just after the Memorial day weekend, upon the completion of all the college tournaments. We’ll post again with the matchups and some quickie predictions. Here’s my first cut through tracking the various local high school baseball tournaments. As we learned in 2014, Maryland and Virginia’s schedules are quite off from each other, with Maryland’s state tournament starting before Virginia’s public high schools even finish their regular seasons, but we’ll keep track the best we can. Here’s 2014’s final prep wrap-up post, with all the various winners noted. As the Maryland playoffs kicked in, there was an interesting WashPost article about how to setup your pitching for the playoffs. Ironically, one of the main teams mentioned (Reservoir) was upset in the Maryland playoffs, perhaps due to their rotation choices. Personal connection useless tidbit; the Chantilly coach (Kevin Ford) was a long-time local Vienna player and we played with him and his brother (Jeff Ford) all growing up. Virginal district tournaments get started last weekend and most are scheduled to finish this week. The VHSL site has some district brackets already published. Here’s a preview of the district tournaments for local conferences with the leading contenders. 6-A Conference 5/Concorde: Oakton and Chantilly are the 1/2 seeds, and Oakton has to be a favorite for the 6-A North regional title. 6-A Conference 6/Liberty: McLean and Madison are 1/2 seeds, playing semis on 5/19/15. Madison lost out to McLean for the district title but may be a co-regional favorite with Oakton. 6-A Conference 7/Potomac: South County & Lake Braddock perennial favorites. 6-A Conference 8/ Cedar Run: Rivals Patriot and Battlefield are 1/2 seeds and have already played three times this year. Both should challenge for the regional title, but I suspect they’re slightly behind the Oaktons and Madisons this year. I’d love to see an all-Vienna regional final, but teams like Chantilly, Battlfield and McLean could be pesky. 5-A Conference 13/Capitol: Marshall and Edison are the 1/2 seeds, as they were last year. 5-A Conference 14: Stone Bridge repeats as conference champ, with Broad Run the 2 seed in this small group. 5-A Conference 15: Mountain View and Potomac are 1/2 seeds. 5-A Conference 16: Halifax, Patrick Henry-Ashland are perennial favorites. I’d guess Marshall and Stone Bridge are early 5-A regional favorites, but we have no idea how good some of these non-DC area teams are. There are some DC-local teams in the 4th and smaller divisions (mostly in Loudoun County). We’ll go through them once their brackets are made available on VHSL. The best 4-A team out there is probably Loudoun Valley, currently in the WP top 10. 4-A Regionals: both of last year’s finalists (Chesapeake and Sherwood) lost early as new blood takes over Maryland states. Perry Hall out of Baltimore took out both number 1 seeds in its regional to take the 4-A north. Wise from Upper Marlboro also took out two PG-county #1 seeds to win the 4-A south. Severna Park beat last year’s 4-A champ Chesapeake en route to the 4-A East championship, and the 4-A West regional final came down to perhaps the two best local Maryland teams, with current #2 All-Met ranked Gaithersburg taking out Montgomery Blair to reach the state semis. State Semis: Perry Hall v Severna Park, Gaithersburg-Wise at U-Maryland on 5/19/15. State final is scheduled for 5/22/15 at Ripken Stadium in Aberdeen. 3-A Regionals: Last year’s state finalist North Harford (Plyville in North Maryland) repeated as 3-A north champ. Mt. Hebron in Ellicott City pulled the big upset and beat last year’s champion Reservoir in the 3-A East regional final (perhaps because Reservoir lost their ace Cody Morris to TJ surgery). Chopticon (way down in St. Mary’s county) and Urbana (just south of Frederick) filled out the 3-A state semis, beating last year’s regional winner Thomas Johnson en route. State semis set for Joe Cannon stadium in Hanover on 5/19/15. 2-A Regionals: Eastern Tech, Patterson Mill, South Carroll and last year’s champ Southern make up the 2-A state semis (mostly smaller schools outside the DC area). 1-A Regionals: McDonough, Colonel Richardson, Douglass and Brunswick make up this year’s 1-A state semis (mostly smaller schools outside the DC area). DCIAA: the regular season runs through 5/20/15 and the DCIAA tournament runs through 6/3/15. DCSAA: the 2015 tournament has yet to be scheduled. Remember, there’s not usually much suspense in who is winning the DCIAA; Wilson has not lost to a DCIAA opponent in more than 20 years. MIAA: Powerhouse Spalding beat Calvert Hill to repeat as MIAA Class A champs. St. Mary’s-Annapolis won the MIAA-B championship, also for the 2nd year in a row, and is 52-3 over the past two seasons. ?? won the MIAA-C.
VISAA: Liberty Christian repeated as the VISAA Division 1 champ. Local teams O’Connell, Flint Hill and Paul VI entered but lost (the entry to this tourney seems to be done via rankings, as opposed to results in the respective league’s post-season tourneys, since Flint Hill was upset but still got invited to VISAA). Greenbriar Christian took the Division 2 title and the Southampton Academy took the Division 3 title among smaller Virginia private schools. 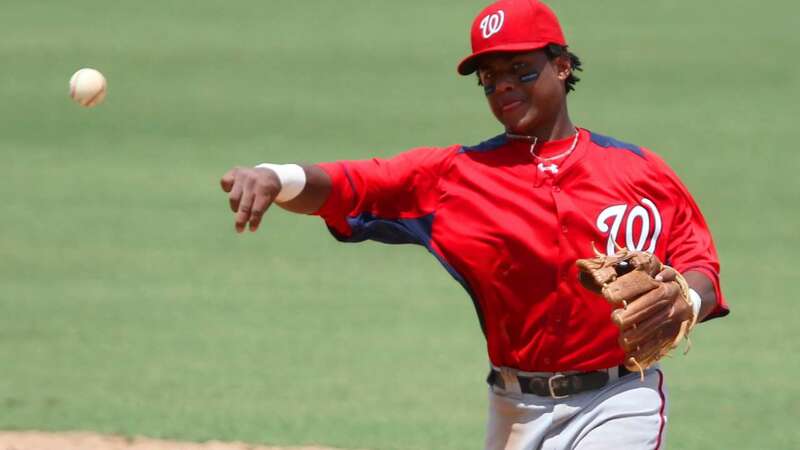 WCAC: St. Johns topped DeMatha in a 3-game series to win the WCAC for the 2nd year in a row. Washington Post All Met Sports Baseball top 10: Spalding, Gaithersburg 1-2, then Oakton, Madison, and Battlefield. Stone Bridge 8th despite a win over Madison in Vienna. Baltimore Sun Rankings page: They also have Spalding #1, then Calvert Hall and Reservoir. USA Today High School top 25 (most recent ranking 5/6/15): Western Branch closest to top-25, ranked 30th. Spalding (Washington Post’s #1 team) ranked 50th nationally. Bonds to sue MLB for collusion; Is he right? In 2007, Barry Bonds played in 126 games (missing half of September but otherwise just getting routine days off throughout the season), put up a slash line of .276/.480/.565, with 28 homers in 477 PAs, good for a a 169 OPS+. A 169 OPS+ would have led the majors in 2014, for context of how strong an offensive season he had. He led the league in walks, intentional walks and OBP. He was an All-Star. His bWAR on the year was a healthy 3.4 … but was hampered a point and a half by his sub-par defense since, of course, he was in the NL and had to struggle around left field day in and day out as a 42-yr old. He entered Free Agency … and never signed a new contract. His last game was a 0-3 random September performance for a 90-loss Giants team against the Padres and Jake Peavy. This week, now that Bonds’ remaining legal issues are past, he’s apparently contemplating a collusion lawsuit against MLB, alleging that the 30 owners basically got together and collectively agreed not to sign him. He alleges that this collusion ended his career pre-maturely. At the time, there was a massive circus atmosphere surrounding Bonds. 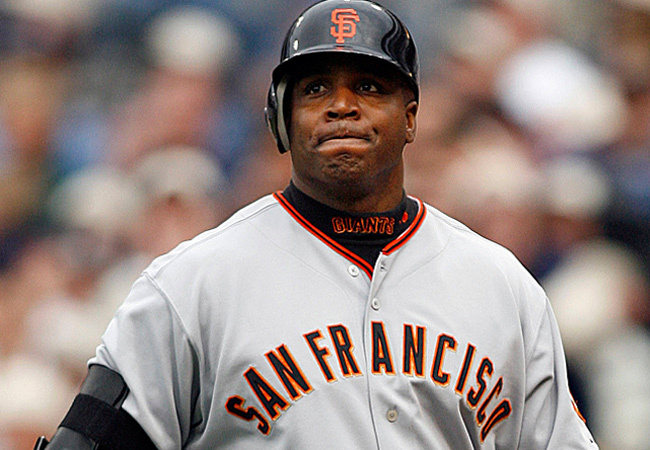 In November of 2007, just after the World Series ended and the FA period officially began, Bonds was officially indicted on federal perjury and obstruction of justice charges. Even notwithstanding an outstanding federal charge, Bonds had just broken Hank Aaron‘s record and had a massive contingent of reporters following him around game to game, with heavy, serious questions about the extent of his steroid usage still unanswered but being questioned daily. Bonds was also well known for being a surly teammate and a horrible clubhouse presence. I specifically recall thinking about a possible signing of Bonds and completely understanding why teams may not have wanted to do so, because of the PR hit. So, which makes more sense, that 30 MLB owners, each of whom is competing against the others to try to win, would each individually arrive at the conclusion that they’d rather not have a PR nightmare versus having a 43-yr old guy still capable of batting clean-up in the majors willing to play for the MLB minimum? Or that the commissioner would lead yet another collusion effort against a player? Who wouldn’t have wanted to add a potential 5-win clean-up hitter playing for less than $500,000?? We should note, by the way, that we are talking about a commissioner at the time in Bud Selig who was directly involved as an owner in *multiple* proven collusion incidents, which resulted in millions of dollars of penalties being paid to damaged players through the 1980s and 1990s. We’re talking about a commissioner who was also (basically) still an owner, who clearly worked on behalf of the owners, and who had taken a massive publicity hit to his reputation for his role in enabling the whole PED crisis in the first place and (in my opinion) was certainly ready to move onwards from the daily embarrassment that Bonds represented to the league. Here’s some additional good reading material on the topic: Si.com’s legal expert Michael McCann studied the case back in 2012 and goes far deeper into all these topics. Yahoo sports’ Israel Fehr has a nice summary with links to other reporters with more analysis. And Grant Brisbee has a great retrospective on the idiocy of teams who passed on Bonds but who paid other players that off-season. My 2 cents: i’m almost certain there was some collusion going on … but that it’ll be very difficult to prove at this point, 8 years onward. And, there’s enough of an argument that can be made that teams made the same decision that the San Francisco owner made before the season was even over; enough was enough with the daily PR nightmare and he decided to go separate ways. What do you think? ps: useless fact: did you know that Bonds was just the 6th pick in the 1st round of his draft year? Going ahead of him was B.J. Surhoff, Will Clark, Bobby Witt, Barry Larkin and a HS catcher who washed out in the minors named Kurt Brown. Do you think the Chicago White Sox are kicking themselves for getting absolutely nothing out of their first round pick instead of picking Bonds? Bonds btw nearly has as much combined bWAR as those four MLBers picked ahead of him … and those are not exactly slouches for players, and includes a Hall of Famer in Larkin. Prior to the season, MLB’s players were polled and our own Bryce Harper was voted “most overrated.” Over Yasiel Puig, for the second year in a row, that both players were listed 1-2. You know what I think? 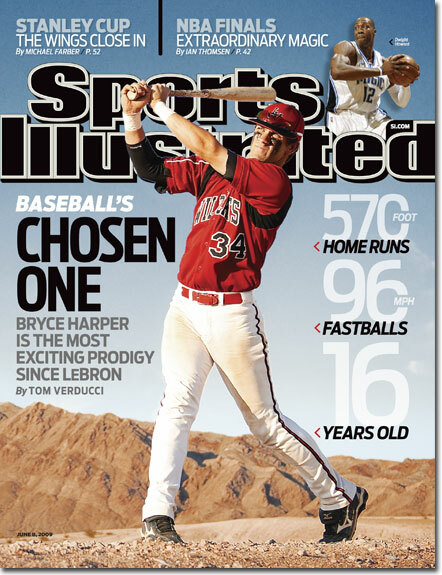 I think that vote should actually be called, “Players you’re most jealous of because they’re incredibly good and accomplished at a young age.” It isn’t Harper’s fault that he was asked to be on the cover of SI at the age of 16. And it isn’t Puig’s fault that he’s burst onto the scene and has posted a career OPS+ of 150 (!! even I didn’t know it was that high) so far at the age of 24. 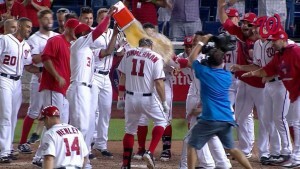 After yesterday’s 3-homer show and especially after his performance last post-season, under the hottest lights and against the best of the best, does anyone still think Harper’s over-rated? How many guys are there in the league with that kind of power who also have his defensive capabilities? Not too many. I’m not sure what Harper has to do to “earn” the respect of his peers .. maybe its just as simple as putting together a full season w/o injury to see what kind of numbers you can put up in 150 games or so. So, after destroying the ball in Atlanta (30 runs in 3 games) and getting what feels like an early “turn around the ship” 13-12 epic come from behind win, the team goes to New York and takes 3 of 4 from the Mets (who were theretofore undefeated at home and had the best record in the game). Even if you don’t think the Mets are really that good, it was still a statement series to go to a divisional rival ahead of you in the standings and take 3 of 4. They couldn’t beat Matt Harvey (who can these days? ), not even with Max Scherzer going, but beat Jacob DeGrom and got the kind of shut-down performances from their #4 and #5 starters (Gonzalez and Fister) that practically no other team in the league can depend on. It isn’t a good sign having to depend on untested rookies and fortunate bounces to get one-off runs that lead to 1-0 victories, but then again, its a great sign that you have a team that *can* win these kinds of games. Now Miami comes to town; they’ve been hot (8-2 in their last 10), but the pitching matchups favor the Nats. 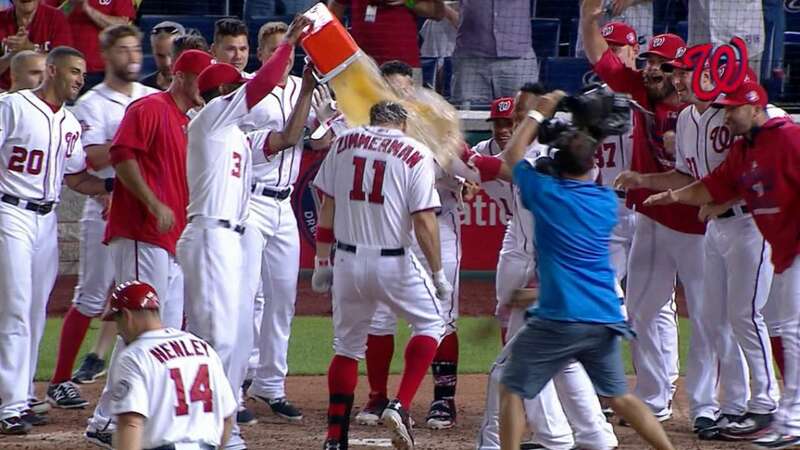 I’ll take Zimmermann, Strasburg, Scherzer (the best 1-2-3 in the majors) over what Miami’s bringing to the table this week (Phelps, Latos and Koehler). Anything less than a sweep of Miami will be a disappointment. The Nats have clear, inarguable pitching matchup advantages, and Latos/Koehler sport ugly ERAs that should help the Nats offense get healthy again quick. 23rd in team Batting Average at .235, which sounds awful but there’s seven teams worse right now. So, the bullpen we’ve fretted about is holding on but could use improvement, the Starters are holding up their end of the bargain, and the offense needs to improve. About where we expected the team to be?